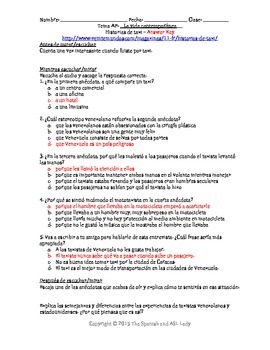 This document contains a link to an authentic source (a native Spanish speaker recounting stories of Venezuelan taxi drivers) and AP level multiple choice questions modeled after the AP exam questions. The discourse pertains to more than one of the AP Themes (Personal & Public Identities, Contemporary Life). I used it in the Contemporary Life unit when discussing careers. 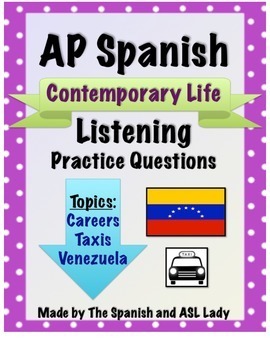 The AP Spanish Listening Questions - Test Prep BUNDLE includes a listening test prep activity for EACH AP theme and is available at a discount when compared to purchasing the products individually. Click the green star by my picture to receive updates about new items, sales and freebies posted in my store!